I can only review this work on its literary impact, not its historical authenticity. However, it has the ring of truth about it. Originally I intended to provide copies of this book as gifts to friends and family who were interested in history, generally. But what of the impact of actually reading about the horrors? Were we not brought up to believe we were the 'goodies', and not the 'baddies'? As a child I wondered what it must have been like for the 'other side' to be 'the baddies'. With Iraq, Afghanistan, etc, I came to a realisation that the goodie/baddie distinction was quite borne of personal perspective. Suffering occurs wholesale by both combatants' families. Now, cast away the smugness and righteousness of what 'our boys' did, and be drawn emotionally into the lives of the other side. Real people who felt the same way about the war. However, they lost, so to the vanquished go no spoils. Well done, Mr Irving, but your work in this case does not a stocking-filler make. It sits upon my shelves as far more a sacred text than perhaps it was intended. Mr.Irving takes the gloves off with this informative and well researched book. Although written in the early sixties, it hasn't lost it's impact. The Allies went way overboard in destroying the city of Dresden despite it's limited strategic value. Tragic story of the murder of thousands of civilians and the destruction of one of Europe's most beautiful cities. A must read for any David Irving fan. 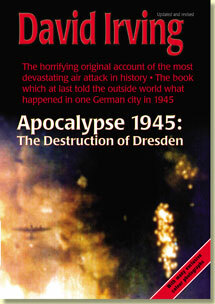 It was his first book and it brought the horrors of Dresden into the public eye. You will really feel for the Germans as you read this.